Crewe Cuban Styling Unit with dryer holder in the shelf and silver footrest fitted as standard. Available in a wide range of laminate colours, shown here in Wenge. Some colours in stock, others may be 3-4 weeks. Please ring for availability on 01270 630280. 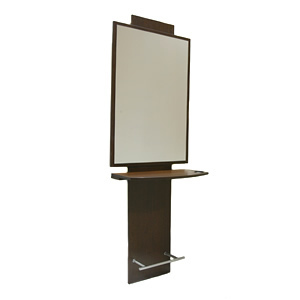 Sizes: Height 200cm, Mirror Width 72cm, Centre Panel Width 40cm, Depth 30cm.